Maybe the British Labour Party could get Nancy Pelosi to do some stupid tweets for them as well. She is an expert at it – see my blog – When neoliberals masquerade as progressives. She thinks it is smart progressive politics to post tweets criticising her political opponents for a policy that “explodes the deficit … dumping … debt on every man, woman & child in America”. A fallacious argument. But moreover, a very stupid strategic argument because it fails to educate the public on what deficits and public debt are and what the capacities of a currency-issuing government and locks the progressive side of politics into no-win dilemmas. When it is their turn to govern they quickly find that they have no room to move on government spending because their own taunts when in opposition are thrown back at them. Same the world over. The progressive side of politics seems to have a lame obsession with meaningless aggregates – like the size of the fiscal deficit or public debt to GDP ratio. Pathetic is not the word. Australia’s national debt has exceeded $500 billion, more than double the debt Labor added during the global crisis but in a fraction of the time, forcing the Coalition to defend its claim to be the better economic manager. Which suggests that the conservatives (Coalition) are worse policy makers because their fiscal deficit has been higher. The Labor Party in Australia has been demanding the Government “drop its planned corporate tax cuts” because they will lead to a “debt blowout”. Idiots. The corporate tax cuts are bad policy but not because the deficit will rise as a consequence. This sort of attack is mindless and doesn’t advance progressive politics. In fact, it holds it back. We know that there is a matching public debt issuance for the on-going deficits. So under those redundant institutional arrangements (more later), it is obvious that if the government is running a deficit then its debt will rise $-for-$. To merely rehearse the line that if a government with lower public debt is doing a better job than one with higher public debt, which is basically the argument the journalist seeks to make in this case, is an exercise in ignorance or deliberate deception. It might be true that the policies that are in place which deliver a higher fiscal deficit are inappropriate than a previous policy regime, but then the opposite might be true. For example, consider a government that inherits a rising deficit due to the impacts of a recent recession and a stimulus package from the previous government designed to overcome that recession. If that government then embarks on an austerity campaign – ‘to repair the budget’ – it will likely stall any growth prospects, undermine its tax receipts and push the deficit out even further. That would be an inappropriate use of fiscal policy. But if the same government continued to support the stimulus path with some further discretionary expansion and eschewed any temptation to ‘repair the budget’ via austerity, then it would see national debt rise (probably under current institutional arrangements) but should be lauded for running the country’s economic policy in a responsible way. So with Pelosi going crazy on Twitter and the same neoliberal cancer occupying Australian politicians, one hoped that the British Labour Party might be a little more inspired, given how bad the Tory government is at present. Where are all these unemployed people? There are no unemployed people. We have created 3.5m jobs since 2010. This economy has become a jobs factory. There were 1.42 million unemployed people (people not in work but seeking and available to work). The Chancellor presumbly has a complex rounding-down algorithm he uses to equate 1.42 million with zero. But while that ‘gaffe’ provided some oohs and aahs and suggested that the Tories remain totally aloof and maintain a ‘born to rule’ stance, it also demonstrates how much scope there is for Labour to exploit if it adopts the write educative frames. Enter another Tweeter, Mr David Lammy, Labour MP for Tottenham, former Blairite (he supported the illegal invasion of Iraq). Here is some of his work. 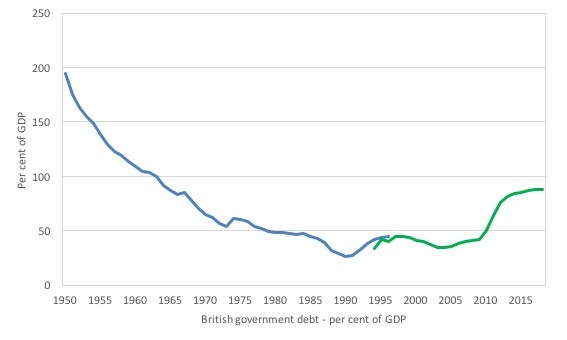 The graph shows the National Debt for Britain as a per cent of GDP. The colours are along party-lines (Red Labour; Blue Tories). The claim is that somehow Blair/Brown were better economic managers than the current government because it had lower deficits. Here is a longer view – from 1950 to 2016. There are two series shown. The first comes from the Bank of England’s A millennium of macroeconomic data. The second comes from the latest ONS dataset – Government deficit and debt return which only goes back to 1992. What do you make of the pattern shown? There is no unambiguous story you can tell from looking at that graph. Were things much worse in 1950 than they were in the early 1980s? You need to know some history to make any sense of it. You need to know why the fiscal deficits (the flows of net government spending), which flowed into the shifts in the debt stocks, were recorded. You need to know what the swings in economic activity were? That would help you know whether the fiscal shifts were cyclical (automatic stabiliser impact) or due to discretionary changes in government policy. By David Lammy’s logic, the last year of Margaret Thatcher’s period as Prime Minister, was an example of better fiscal policy than any period under the Blair/Brown Labour government. Of course, we know that no progressive would make that conclusion. Further, when the Tories came to office in May 2010, the UK was in the grip of a massive balance sheet recession. Given that a balance sheet recession requires the government to run elevated fiscal deficits for an extended period to allow the non-government sector time to restructure balance sheets via increased saving (lower spending than usual), a responsible fiscal policy stance would have seen the newly-elected Tory government increase its public debt for several years. So, under the current institutional arrangements, those blue bars would in fact have been recorded and a sign of the Tories doing exactly what a responsible government should have been doing. Of course, we know that George Osborne imposed austerity in his first fiscal statement (June 2010) and continued, in vain, to ‘repair the budget’, which saw the recession deepen and the fiscal deficit rise. The rise in the deficit was a sign of poorly constructed policy – being driven by the automatic stabilisers – but that is not the point. The deficit should have been even higher and maintained at those elevated levels for maybe a decade or so to get the UK economy growing and providing quality employment creation. Further, one could hardly call the conduct of fiscal policy under Blair/Brown responsible. Neoliberal conservatism is a more adequate description. What the British Labour Party MPs should be saying in the light of yesterday’s British government – Autumn Budget 2017 – is not that the deficit or national debt is too high. Rather they should be highlighting the deliberate undermining of the NHS, even though the fiscal statement provided more funding. There is a massive funding gap remaining for the NHS and the Tory attempts at starving the service is reducing health outcomes for British citizens. The flat productivity forecasts are a sign of failed government policy – and this extends beyond the recent past. Attacking education and training institutions was a favourite trick of the Blair years too. While I haven’t yet read all the documents provided by the H.M. Treasury to support the Chancellor’s statement it is clear to me that Hammond has broken with the recent Tory past by finally accepting that austerity will kill growth and the obverse – you need to increase spending to increase growth. The fiscal stance announced by Hammond is mildly expansionary. But with the Brexit negotiations continuing and the fairly dire GDP forecasts, the sensible thing for the Government to do, once it abandoned the myth that ‘austerity cuts create growth’, would have been to increase the deficit significantly – investing in health, education, training and innovation. The result is a poorer, more indebted British state less able to act in the name of economic justice: the higher pay pledged to low-paid workers by the government under the national living wage scheme won’t now materialise when ministers had promised. The national debt or past deficits do not restrict the capacity of the British governemnt to “act in the name of economic justice”. The Government can always initiate progressive policies, irrespective of the national debt levels. Past deficits do not reduce that capacity. Although, we might add that if the past deficits had been prorated over initiatives that had previously advanced well-being then there would be less to do now! Exactly the opposite to the conventional neoliberal narrative that the UK Guardian continually pushes these days. That Brexit preparations will cost the taxpayer more than the promised extra cash for the NHS appears to underline just what a wasteful and exhausting exercise leaving the EU will be. The Government, certainly, should have allocated many more millions than it did to the NHS and announce reversals to the outsourcing and privatisation squeeze that it has been using to undermine the viability of the health service. But “the taxpayer” will be contributing nothing to the Brexit preparations. Please read my blog – Taxpayers do not fund anything – for more discussion on this point. What the chancellor should have done is to accept that the public sector deficit is the wrong target for policy and end his own party’s obsession with austerity, which has led to politicians endlessly debating debts and deficits with little regard for the human costs of their decisions. Which makes its earlier claims seem rather confused. Of course, it is not just the Tories that have been obsessed with deficits and debt. Viz Mr Lammy and the rest of his party! Which then brings me to a related theme. I get many E-mails asking me about what would happen if a central bank was to purchase all of the government’s outstanding debt and then write it off with a stroke of a computer delete key. Which is really just a specific form of a more general question: what would happen if the government stopped the unnecessary practice of issuing debt altogether to match its net spending? This seems to be a growing sort-of dinner party discussion topic and I get offered all sorts of prognoses from E-mailers ranging from the collapse of the central bank, collapse of the entire monetary system, collapse of the world order, with hyperinflation thrown in along the way. I am regularly arraigned with the view that I am a moron for even advocating this as the preferred Modern Monetary Theory (MMT) position. Moron or not, the short answer to the question is – sorry to say – not very much would happen. In the case of the central bank deciding under government direction to wipe out all the outstanding debt, it would take just a few deft computer keystrokes to accomplish the task. Some big numbers would move from one government account to another on the screen and once the delete button was hit the numbers would then disappear altogether. The non-government sector income would fall a bit until some other spending source came along. Want a bit more detail? Well, first, the central bank would start buying all the outstanding bonds in the secondary market. Owners of those bonds would enjoy an immediate capital gain. The transaction would just swap bank reserves, which the central bank can create out of thin air for the bits of paper we call bonds. The non-government sector’s net financial assets would be unchanged – just the composition – more cash less bonds. The government liability would shift from bonds to reserves. The government (central bank) would, if it held the bonds, pay itself (the treasury) the interest due. Upon maturity the government (treasury) would pay itself (the central bank) the face value of the bond and the bond would expire. The government would have a flow of its own income up to maturity and then a capital amount at maturity. The capital amount might be less or more than the central bank paid for the bond when it purchased it, depending on market movements at that time. So it might record a capital loss or capital gain with no consequence other than an accounting entry being recorded. The central bank could also just write the asset (bond) off immediately upon purchase, which would mean the government was cancelling its own debt and obviating any accounting need to transfer money from itself to itself. The ‘loss’ that would be accounted for (the asset write-off) would have no wider significance. Central banks cannot go broke. The purchase of the bonds by the central bank (irrespective of whether they kept the assets or wrote them off) would reduce the income flows for the non-government sector over the life of the bond. Why? The shift in wealth composition is more cash (no interest payment) less bonds (lost interest income). Would the decision lead to inflation? Well, to answer that question you have to work out whether it would push nominal spending in the economy beyond the productive capacity of the economy to absorb it. Short answer: Why would it? The only likely effects would come from the lost income of the non-government sector which might reduce total spending in the absence of any countering spending increase from elsewhere. Clearly, the government could stop that negative spending effect. The decision would have no significant effect on the yield curve once we acknowledge that government bonds disappear. The central bank could still maintain whatever should term policy rate it desired without open market operations by simply paying a commensurate support rate on excess reserves. While buying the bonds, the yields would be driven down, which would probably impact on other returns. But eventually that impact would dissipate. If it didn’t choose to do that interest rates would fall to zero (or whatever the support rate was). There might be some impacts on the capital account of the Balance of Payments given there would be less fixed income assets (bonds) available. But these would be trivial and would be biased towards pushing the exchange rate down a little and pushing international competitiveness up a little. So the answer is: not much. It continues to amaze me how lame some progressive politicians are. They think it is clever to skewer the conservatives on matters pertaining to deficits or public debt ratios. But the reality is that all they do is make it harder, when and if they are elected themselves, to pursue progressive policies. Both sides of politics then get stuck in a ridiculous and erroneous discussion about whether the deficit is too high and take their eye of the real challenges relating to well-being. Its correct that you take David Lammy to task about his crass Twitter post with regards Philip Hammond’s Budget for the UK – indeed, I often take many MPs to task for their economic ignorance, specifically the fetish over deficits and actual GDP growth, which in itself is no panacea to the economic ills affliction billions worldwide. Suffice to say, elected officials at a national level should at least take a course in political-economy, one that highlights the BS contained within much neoclassical economics & day to day realities that underpin heterodox economics, of which MMT makes a valuable contribution. Stephanie Kelton also took a few of these Twitter posts to task, which was a positive in my book. Absolutely bad economics and bad politics. The progressives present a stick for neo liberals to beat them with. The next impact of QE is that the mostly rich people and pensions who own it have to look to riskier assets to get their returns. This pushes up share and realty prices. I find it deeply distressing that there is no groundswell of understanding amongst UK politicians, journalists or other commentators to challenge the moribund orthodoxy. You only have to listen to the talking heads on bbc radio and tv, especially the ‘experts’ to know that the insights provided by MMT have no currency amongst such people. I am now banned from watching said channels if anyone else is present! So I have a proposal. Would anyone else out there be interested in setting up a group to disseminate an MMT viewpoint and target UK MPs and journalists? Count me in Andy, I’ve only been aware of MMT since July but it has proven a profound revelation to me and I’m really keen to disseminate it as widely as possible. I’m still struggling with banking procedures as I have no background in this field but I’ve grasped the central facts of MMT and I think we really need to reframe the whole political argument away from the notion that it is the government’s prime role to “manage” the deficit, reduce debt etc, but rather it should be about improving the quality of life for its citizens and working for a non-destructive proactive role in the world through our foreign policies, trading relations and environmental policies. Andy: the reason that ignorance of macroeconomics is so rife among politicians and journalists, and indeed most of the “elite” in the UK and around the world is because they are trapped in groupthink. In the case of UK MPs, many of them went to Oxbridge and studied PPE. PPE of course being Philosophy, Politics, and Economics – and in their economics course they were taught all sorts of fallacies, such as loanable funds etc… So they think they know how the world works, and everyone they know has the same view of how the world works as they do. The fact that Positive Money ran a poll that showed that 85% of MPs didn’t know that banks create money when they make new loans shows just how hopelessly out of touch they are with reality. They simply have no idea of how the monetary system actually works, and these are the people in charge of running the country. But when you have attended an elite university which has taught you a fictitious version of economics, which everyone you know subscribes to, and all “sensible people” agree with, and you and all your friends are members of an elite, it’s very unlikely that you are going to change your views, because the illusions you live under are simply too powerful. So here we are, stuck with household analogies being spouted by those who should know better, but don’t. 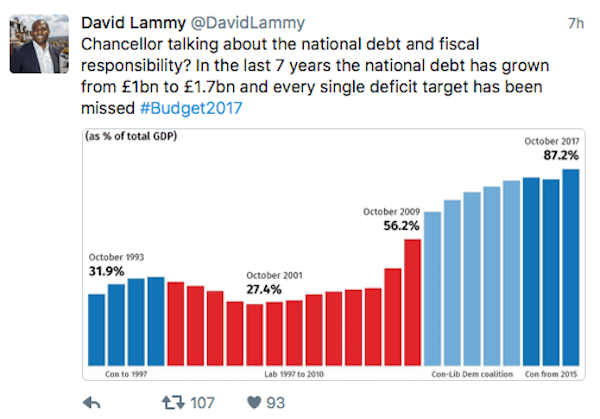 MP David Lammy tweeted that Britain’s national debt went from 1 billion pounds to 1.7 billion pounds. In North America, that would have been 1.7 trillion. Do the Brits use the same big numbers as most continentals do, that is, million, milliard, billion, billiard, trillion, trilliard, etc? Just curious. Warren Mosler made an interesting observation in one of his lectures recently. When asked why do politicians say [or believe] the erroneous data about the economy -I don’t recall the exact words- he answered ” because it’s what we the public believe”. One can infer that if we the public change our tune the political discourse will also change. It is a bit circular though. We believe because the pollies say it and the pollies believe because they believe we think it. This is going nowhere without a circuit breaker. For me the circuit breaker will be some catastrophe that can’t be explained away by the fakery we suffer from today. It seems hard wired right now. John-I agree with you. The hard wiring is just that. The nonsense has become mental wallpaper. Almost everyone I talk to (supposedly well-educated people-doctors, solicitors etc) look at me as if I’m nuts when I try to reframe things. In individuals’ lives things often don’t change until a BIG crisis happens and it may be that our society needs a ‘nervous breakdown’ before change can happen which will be messy. I’m often shocked at the level of ignorance and lack of intellectual inquisitiveness out there. I f someone like me (who is not particularly academically bright) can pick up a few books that question economic orthodoxy, for the life of me I can’t see why more people are not able to do this. The way I see it is that neo-liberalism’s great achievement is to dumb-down the whole culture-this started with the Murdochisation of the press in the 70’s. I’m constantly surprised at the intellectual laziness and zombiedom of our populace. Even now, in the UK, the Tory vote holds at about 40% despite the cruelty of socila security cuts, decaying infrastructure, struggling schools, unaffordable housing ( to be even more unaffordable after the recent budget). problem Labour has is that even if it became MMT fluent the public would not accept it because of the mental wallpaper that seems so movable. The political class are not trapped in groupthink, they are wedded to it. It has served their class constituency very well over the last 30 years, no matter how unhappy a marriage it is for everyone else. David Lammy is very new labour anyway and Corbyn/McDonnell are extremely reluctant to make any waves beyond the ‘schools and hospitals’ stuff. Keeping their powder dry in a damp basement is the closest I can see their tactics to be. The Labour party loses all the same when they spout the nonsense, so they may as well lose by becoming MMT fluent. People will be more inclined to lose the mental wallpaper if the message comes from people which are seen as leaders. Richard / Simon. I think the assumption that minds cannot change is part of the groupthink. I think well educated people are harder to persuade because they are more confident in the validity of their own thought process. Ordinary people might be more open to new ideas precisely because they lack this. The problem is that they are bombarded with the nonsense by people they perceive as more intelligent – but if correct theory/policy gets through and is explained I think they are more likely to swing to it. We just need a small critical mass of journalists/politicians to do it. People are suffering, there are deaths, suicides. Labour in power will improve that to some degree and the situation is desperate. If Labour were to be open about a new framing when the press would eviscerate them and the elite have a field day in ridiculing them (Greece, Venezuela and all that nonsense) and most journalists would also not get it then the chance of a few notches of improvement is lost. Believe me, I have seen the suffering caused by Tory austerity and I know think that a Labour party needs to get in to create some alleviation -when in power and deficit spending is THEN seen to help things then maybe the framing can shift -but for now the suffering needs to stop. Despite having Steph Kelton as adviser, Bernie Sanders knew it would be the kiss of death to try to reframe the perception of Government spending. It’s sad, I know but is it worth letting down all those at food banks/not getting socila care/homeless. Maybe I’m wrong and one should always keep it 100% honest – but we need some alleviation NOW not in another 20 years time when the reframing battle can possibly be won. Thankfully, unless I need to listen again, I believe Corbyn stuck to the cruelty of the austerity drive in his response to the Budget yesterday. A very detailed and hard working speech covering the reality of the effects of the cuts, rather than a droning meaningless scoring comment about the deficit. It is very foolish to criticise something without investigating what it really means, but that is what most politicians do, and they incredulously believe whatever the neoliberal propaganda tells them. John McDonell spoke of a “productivity and infrastructure crisis” (Guardian) – so perhaps there is hope for them. Crumbs to the poor is not a useful political strategy. It keeps the patrons in charge of the patronised – as we’ve seen in Africa for decades. From the conversations I’m having I get the feeling that they like it like that, since it gives the patronisers purpose. It’s very easy to fix poverty. You simply ensure that latent output gap is transferred entirely to the poor, and capital is disciplined and forced to share productivity with the workers. That is what the Job Guarantee does. I’m finding that you can sort those who actually want to solve the root cause of the problem, from those who want to fiddle around the edges while making themselves look good simply by asking them if they support the Job Guarantee. Labour have lost the last three elections messing around the edges trying to lie more convincingly than the Tories. How many more times do they need to lose before they get the message? There are constituencies out there that are targetable. It ought to be fairly easy to get the student vote, the unemployed vote and the lower working vote with the MMT viewpoint – particularly if you cast the bankers as the scapegoat and say you will constrain them. You then couple that with financial support from those firms who want the parasite businesses that compete with them eliminated – which the Job Guarantee does. We’ve been targeting journalists and existing politicians for some time, and they are not taking on the information. That’s because the current conversation suits them and their own metro-liberal agenda. You have to find people who are excluded from the conversation and get them onside to get a power base. Rather than journalists/politicians, I’d be more interested in what people like Tim Martin thought of the approach. And those visiting the Job Centre. But that’s where it needs to end. And be quickly followed by an explanation of precisely why you can’t ever achieve growth by cutting spending. Neil, some journos are actually reading what is sent them but others don’t look like they are even skimming the stuff. They seem to be really stuck. Some appear to have been captured by the mainstream narrative with a halo effect operating. It is not just cynicism in action. Or so it seems to me. Sandra, I certainly hope so. in my attempts to explain MMT online and to friends, I have concluded that it one of the most difficult subject ever to explain to others. As a retired control systems engineer, I am sure it would be easier to explain the workings of a Kalman Filter algorithm to the average punter than MMT. Why? Because your punter has no misconceptions about the Kalman Filter. He/she doesn’t switch on the TV or pick up the Daily Rag and read that the Kalman Filter works due to fairy magic, and indeed doesn’t require any inputs or data of any kind to work perfectly – in fact you just have to say the words “Kalman Filter – be working!” and it just works. Everybody knows that! If this propaganda had been aimed at your punter for the whole of his life, he would just laugh at my attempts to explain how it really worked and what formulation and data it needed to function. He would find the details brutally boring, and conclude that I was obviously some kind of crank. His friends would agree. This is the major problem we face – trying to explain MMT in the face of current and historical propaganda requires a lot of patience and a gentle approach. “Honest, I know what I’m saying sounds crazy, but the TV and the newspapers are lying to you! All those economists know nothing about economics! The government and treasury have been lying to you since 1971!” The punter is covertly dialling for help as you speak. Generally I find that it is best not to bother. What you do is what others do – you appeal to authority. And we are starting to get that authority. Stephanie tore a strip off Lammy and he was compelled to respond. Bill’s authority commands the same respect. You dismiss the usually how do you pay for it thus: “By spending the money”. Then you stop and when they ask the next question you say “Because that’s what People Cleverer Than You say is how it works. Look they talk to the Labour Party and Bernie Sanders. Now would you like a living wage job or not?”. It’s one thing to say that the political left should not be advancing radically new economic framing while out of power (and while trying to obtain it). But the political left–including Corbyn and McDonnell–tend to go well beyond this. They affirmatively, and needlessly, endorse the neoliberal framing that balanced budgets are a good and worthy pursuit and that government “debt” is bad. It seems to me there is a middle ground here the organized political left could pursue while out of power–which is to refrain from (officially and publicly) promoting radically new frames while also refraining from affirmatively endorsing neoliberal tropes. I am not sure I would prefer that approach to one that takes up the issue directly even while out of power, but I do think this middle ground would be fairly easy to pull off, and the fact that it isn’t being done suggests to me that the political left is on balance still under the influence of neoliberal group think. If you do get any engineers in a room, then explaining MMT in terms of reactive and real power works. Government spending is the reactive power of the economy, required because we no longer have a feudal resistive production, but modern inductive production. In an AC system reactive power is taxed back 50 times a second and has to be sufficient to accommodate savings in capacitors. When in doubt integrate….and keep on integrating. Brian has summed up the problem very well I think. One approach may be to target Momentum. These are the real foot soldiers in the Labour party and they do affect policy decisions. I’ve talked to one or two about MMT. They are receptive but the focus is always on getting into power and they work at a local level. I guess we just keep plugging away trying to keep and enhance anything that looks like it’s working. MPs and pols from every major country won’t pay any more attention to MMT, or only slightly more….unless you show their constituencies a better way that they are able to understand because it is elegantly simple. You have to engage large constituency’s self interests like students, the common man and the small to medium sized business community with a policy or policies that will obviously benefit them….directly and unambiguously. I’ve been telling Steve Keen for years that he’s preaching to the choir. His recent Patreon campaign is a step in the right direction, but his message is still way too complex and therefore won’t adequately communicate. MMT is right about money mechanics, but its message is also way above the heads of most people. You need a single concept and a set of policies that will show the above constituencies what’s in it for them, and/or if they’re open to it, what it can do for others, the system and the nation. Then you create and focus a mass social movement out of that concept and policies that is able to herd the entirety of the political apparatus toward their implementation. It worked for Ghandi, it worked for MLK, Jr. ….it can work for the money and economic systems. @AndyB Momentum is certainly an avenue worth considering. At the same time some of the worst ‘progressive’ offenders are within the current Labour leadership. RLB, a possible Corbyn successor, can be found stating in public the threadbare neo-liberal mantra ‘we must live within our means’ and is in this way indistinguishable from many Tories and LibDems. I wish Corbyn in addition to pushing the vote winning anti-austerity message also explained that the economics which underpins austerity is simply wrong and took the opportunity to promote an MMT line. As it is Labour seem intent on attacking austerity but propose solutions within a neo-liberal framework. You channelled Morpheus and his Red Pill very effectively, and I’m very grateful to you for that. There is an increasing number of posters carrying the baton at the Graun, and even one or two recent, if slightly flawed, articles appearing there as well, so although you seem to have given up on that forum, I’m certain your efforts were not wasted – and I continue to read your Twitter posts with interest. I disagree that what is needed is a single, simple package. 1. MMT is essentially a world-view, an explanation of how (macro)economics works. It is compatibile with many political choices. The main focus for politicians is on how to get elected (as a commenter above noted). Once they are elected they then act on their own world-view, and what they think they can get away with. So obviously, the ignorance of politicians, and that of the public, is an impediment to rational-policy-making. But there is no point coming up with policies, and trying to sell them on the basis that they are MMT-compatible, because very few people will be in the least bit interested. 2. You need different packages for different audiences, one very simple set of ideas for the general public, one tailored to journalists, one for politicians, one for business leaders, and so on. Mr Shigemitsu, yes you’re right. This article appeared in the Guardian the other day https://www.theguardian.com/commentisfree/2017/nov/20/budget-increase-national-debt-pay-rise-britain-bill-clinton-philip-hammond#comment-108503995 which went along the right lines. Of course the next day the Guardian Economics correspondent was churning out the usual myths. Maybe MMT is a world view, but it’s also based on a lot of detailed information about banking operations, and the effects of bank and government money creation at all scales in society. I’m not saying that MMT doesn’t have empirical foundations. I’m saying that trying to build a mass social movement is not going to achieve the success that its founders would hope for. Currently the main game in town is what can loosely be called “neo-liberalism”. Bill has document that its roots lie in a deliberate and sustained campaign of “re-education”, operating at many levels, but not mainly focused on building a mass movement. dnm, Bill doesn’t see marketing and the like as one of his strengths, possibly necessary to build a mass movement. He is an academic. His role as he has characterized it is to develop and put forward ideas and analyses and for others to engage in the other activities that may be necessary for general acceptance. Mosler has been trying as well as Kelton to change the minds of legislators. As receptive as Sanders has been to Kelton’s views, it is unclear whether he has taken her views completely on board. Mosler has said that his successes have been uneven, and he is something of a politician. So, it seems to me to be a tad unfair to expect Bill to be able to do everything. Building a mass movement is a quite specialized skill. What Bill has is his integrity. To me, this counts for a great deal. I’m not expecting Bill to do anything other than what he is already doing, which is, as you imply, a lot. I think it’s good that Warren Mosler is doing his thing, and Stephanie Kelton is doing hers. Let a thousand flowers bloom, I say! In fact, that is my point of disagreement with what commenter Steven Hummel wrote. I think a cultural change is needed, and it may come about through specific people or groups working on specific though related objectives, but is unlikely to be realised by any attempt to create a single mass movement, with the brand name “MMT”. Where are you based? Would you be interested in meeting up with others in London to kick around some ideas which might produce 0 or more streams of activity? We have reached a point where the political class in the UK have acknowledged that they haven’t got a clue and have given up. The Budget and Lammy’s twit being two indicators of this. Education, “marketing”, even very black comedy and who knows what other ideas may be useful in trying to change things. But we should make an effort. You’re both right of course, and my comments are not to be considered a critique of Bill or anyone else. The fact remains however that a mass social movement is the correct vehicle for the political success of the various heterodox theories, and that would best be accomplished by an integration of the truths in each of them expressed in specific direct policies that every agent could easily perceive was in their self interest and was also attended by a resonantly humane and valid philosophical/psychological concept that they could easily go into agreement with. Unfortunately, I’m not currently based in the UK. I do keep my eyes open for opportunities to contribute something useful. I broadly agree with your latest comment. One worry is that self-defined MMT groups end up spending >95% of their time preaching to the converted, in a best case scenario. In the worst case, the attempt to find a “valid philosophical/psychological concept” that all can agree on consumes all available resources. Ideological purity is the enemy of practical results. To me. The most basic and ‘understandable’ observation of MMT is the recognition of the way round the money circuit works. I’m talking high powered /currency money. In other words contrary to popular misconception spending comes first then it’s taxed or ‘borrowed’. Of course it isn’t a circuit because the right way to think about it is in terms of the stuff being created out of nothing and destroyed. Perhaps we could come up with a reader friendly description that we could put into one of those petitions that parliament has to debate if over 100k signatures are obtained. That would give us an idea of the awareness out there. We could plug it on the that well known progressive Guardian website, and elsewhere Twitter and other social media of which I am basically ignorant. We don’t have to mention MMT or run it by the boffins in case they insist on accuracy and therefore a more complicated message. I’d be happy to make an effort on the wording. Well yes, but looking at the expressed goals and policy suggestions of the various heterodox movements of MMT, Keen’s Minsky Instability/Disequilibrium theory, Michael Hudson’s Financial Parasitism, Ellen Brown’s Public Banking and the handful of monetary reform movements….an underlying conceptual thread can be discerned. And along with other policy extensions and innovations, I’ve spent the last several years doing an exegesis of that common thread concept. So for the most part that effort has already been done. I’ve just been catching up with reading Bill’s blog. I’m probably too late for many to see this, but I’d like to contribute. I suspect the problem with getting MMT is worse than is outlined above. Certainly MMT is spreading, but its a slow process. MMT is also a subject that takes a quite a bit of work AND a willingness to work at it. If understanding doesn’t come immediately, you need to revisit the topic of current difficulty, perhaps a number of times, until the light comes on. It’s then so obvious, you kick yourself. BUT few are willing to put in this effort. When talking with others about MMT, I am always challenged with a neo-liberal line. Gradually I am learning how to respond to repel the challenge. Sometimes I’ll kill it, often it is only wounded. But the conversations are always time limited (if not attention limited). Just occasionally, I have talked to people who are genuinely interested and will take the trouble to listen and, of their own volition, will return to me with questions. But the neo-liberal paradigm runs deep. When they then talk about an economic topic at some later time, what they say is often a mish-mash of half understood MMT based ideas and neo-liberalisms. However, the killer is when they go away from a really good discussion and they talk to another friend. They start repeating their new-found MMT based knowledge. They, in their turn, are challenged and the ideas shredded. They find themselves with insufficient knowledge or confidence to defend themselves and the MMT ideas. They feel belittled and humiliated. They don’t try again. It hurt too much. I don’t know how to overcome this. My conclusion is that somehow the MMT paradigm needs to go viral through the youth of today using the power given by facebook, twitter etc. Not having an account with any of these platforms, I don’t know how to approach this.